Ask the RD: Is Millet Nutritious? Answer: Millet is an “ancient grain” that is increasing in popularity owing to its nutty flavor, chewy texture and good nutrition. While quinoa is very familiar to Americans and seen everywhere from trendy bowls in fast-casual restaurants to pancakes made by home cooks, millet is just being discovered. Actually, most of us do know millet, at least by sight. It is the small, round, yellow grain found in your backyard bird seed. Not just nutritious for birds, millet is a good source of fiber for humans, and like other whole grains, it contains respectable amounts of folate, iron and potassium. It has 5.5 grams of protein per serving (¼ cup dry millet), which is comparable to the 6 g per serving in quinoa (USDA 2016). Quinoa is known for being high in the amino acid lysine, which most grains are rather low in, making its protein more complete. That difference is because quinoa isn’t technically a grain; it’s the seed of a plant related to chard and spinach. Millet is a staple grain around the world, including in India, many West African countries and China, and it can be found in dishes from porridge to bread to beer (Saldivar 2016). 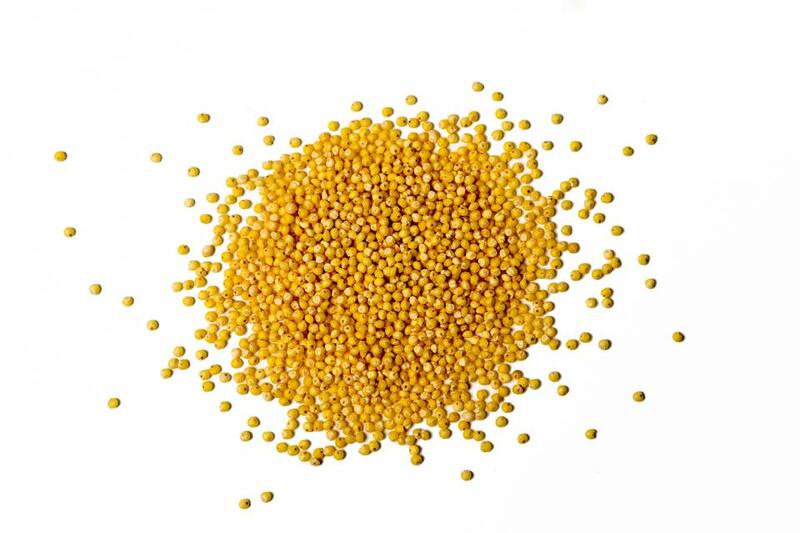 Pearl millet is the most commonly available variety, but millet does come in a range of colors and sizes. Like other grains, it can be cooked using a ratio of 1 part grain to 2 parts water. Bring 2 cups water or broth to a boil, add 1 cup pearl millet, cover, and simmer for 20 minutes. Turn off the heat and let the millet rest, covered, for 5 more minutes. Quinoa needs less cooking time: about 12 minutes and 5 minutes off heat. You can use millet in all kinds of delicious ways, just like quinoa; for example, as a base for plant-based burgers, in grain salads, in pilafs or as a hot breakfast cereal.